When we teach our students with social pragmatic deficits about social inferencing it can help them be more aware of themselves and other people. 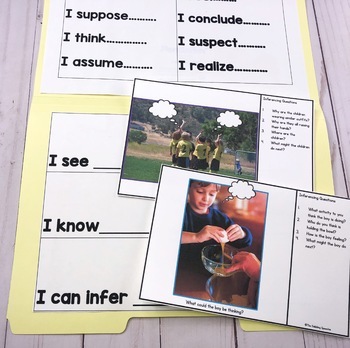 Plus, it also works on answering those tricky higher order thinking questions, which is great for reading comprehension. What SLPs will love about this ⭐FREE resource⭐ is that it is easy to prep and will help structure your next social skills therapy session. the students “see” on paper to help with remembering all the details. the academic vocabulary to signal or mean “making an inference”. -What the people could be thinking? -Where might the person be or what might they do next? -When could this be happening? -What could the person be feeling? How do you know? 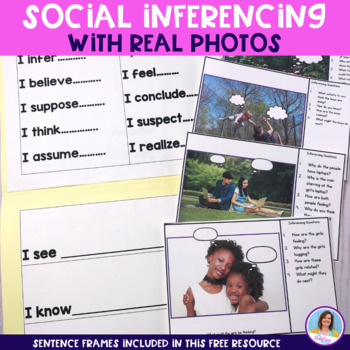 If you are needing more real photos or social situations that target non-verbal cues and inferencing, you can find more photos just like the ones included in my Social Skill Breaks Curriculum: Social Skills Activities For SLPs. Want more social skills activities, so you don't have to stress about what you will plan for your next therapy session!? One buyer said this about how her students felt about doing the activities in my Help! I Need Social Skills, "My students working on social skills enjoy this and don't even mind writing out their responses in the columns, which is usually a chore for them. Thank you!" Another buyer shared that his/her students LOVED using this activity! Check out her feedback, "I LOVE this activity....thank you for creating this engaging set! Now that I tried it with my students, I can tell you they are crazy about it and beg to use it. This set will be a fun way to kick off some role play activities to tie in as well . Thanks for adding even more pictures. This set ROCKS!!"